I told people yesterday that I was "finally" going to get to see "Secretariat," which is a little ironic because it won't be out in theaters for another two weeks. However, my parents had seen it at a Livonia screening two weeks earlier, and there was an earlier Southfield screening that I hadn't been able to go to. Luckily, Jackie from Free Is My Life was able to hook me up with a ticket to this one, and we definitely go the VIP treatment, as the tickets were set up through Disney: we got to skip to the front of the line and had reserved seats. I was prepared to like "Secretariat" after the rave reviews I had heard, but it actually ended up surprising me—in a mediocre way. It was a bit slow for the first half or so, but then it picked up rapidly during the second part of the movie. Penny Chenery (Diane Lane, "Nights in Rodanthe") is called home for her mother's funeral, and she learns that two of her mares are pregnant by one of the fastest horses around. She decides to commute between the farm and Denver, where she and her family live, so that she can see the foal be born and grow up. The rest is history: Big Red, or "Secretariat," as he is later called, becomes one of the fastest horses ever, and to this day his Derby and Belmont Stakes records have not been beat. The film has a slew of actors that helped make it great. James Cromwell ("Surrogates") plays Ogden Phipps, who could have owned Secretariat if he had made better choices, and John Malkovich ("Jonah Hex") is Lucien Laurin, Secretariat's trainer. In addition, newcomer Otto Thorwarth is Ron Turcotte, Secretariat's jockey, who helps him to succeed. Yes, see this film. What I liked about the movie is that even though we, as the audience, knew that Secretariat was going to win the Triple Crown, you get to experience this with the characters as he wins first the Kentucky Derby, then the Preakness, and then, finally, the Belmont Stakes. One nice touch was that Disney spliced footage of the original races back in the '70s into the movie. About halfway into the movie I was considering giving it a "Maybe" review, as the story was interesting but not particularly compelling, but as the races started and the pressure on Secretariat to win became more intense, the movie got much better, and that is why it deserves a "Yes" review. 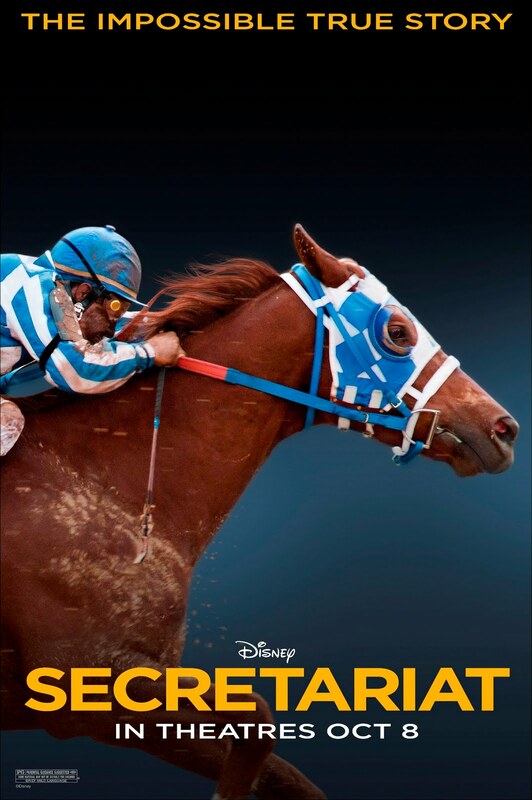 "Secretariat" will be in theaters on October 8th.